Full day (7-8 hours) for 1 or 2 persons - $450. Fly Fishing Lessons - Richard is happy to teach an on the river "Intro to Fly Fishing" class for those beginners or enthusiasts who want basic fly fishing lessons. Please call or email if interested. Call for details of our cancellation policy. Richard also is a conservationist and has done volunteer service work with Putah Creek Trout, Department of Fish & Wildlife's Heritage Wild Trout Program, and served as a mentor for the Napa RCD's SLEWS Youth program. He has taken several classes at the Napa Juinor College towards an Environmental Sciences Certificate. His favorite, "Wildlife & Fisheries Biology," was taught by the Napa RCD's Dr. Jonathan Koehler. If you run into Richard on Putah Creek he will often be found with his rescue dog, Rusty, close behind. Richard will either be either be shouting: "WHOO-HOO!!!" when hooking up, or cleaning up trash that others have left behind. Of his passion for fly-fishing, he says, "I would do just about anything to get a chance to fish; to stand out in a river and let my thoughts wander. It's the most peaceful place in the world to me -- the place I feel focused and free." Outdoor Adventures - We offer guided fly-fishing trips for one or more people. Richard can also accommodate small groups up to six people; depending on our other guide colleagues' availability. 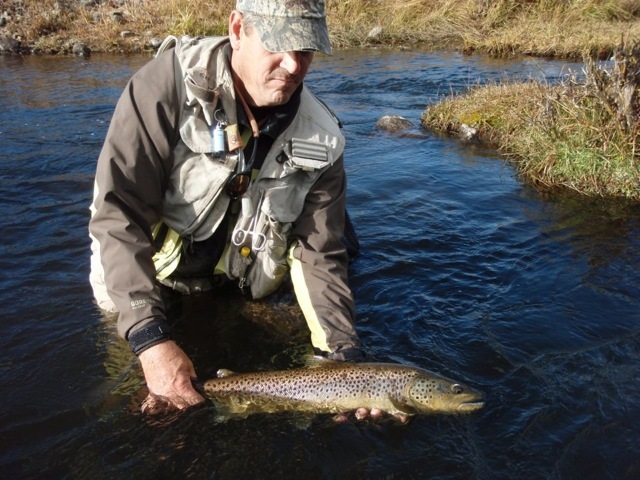 Richard provides all Fly Rods, reels, and related fly-fishing gear for your trip. We do rent all sizes of wader and boot sets for our walk-and-wade adventures at $25/person. We strive to accommodate our client's schedules and needs and would love to take you on an off-the-beaten path adventure during your vacation or just on a day or weekend trip. Fishing Reports at Lost Coast- Richard does a fly fishing blog for Putah Creek and the other Northern California Rivers that he fishes. You can find his reports on San Francisco's Lost Coast Outfitters' website here. Lost Coast is a great resource for new or veteran fly-fishers and they are located in downtown San Francisco. If you're further south on the Peninsula, try California Fly Shop. Do you live in Napa Valley or are going for a visit? Sweeney's Sports is our local fishing and hunting shop."